Addressing a packed meeting hosted by the CPGB-ML on 31 January, Eva Bartlett, an independent journalist who has visited Syria several times, talked about what she saw there and provided accounts from many ordinary Syrian citizens. 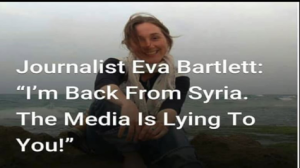 Bartlett focused on the media propaganda war against Syria, exposing the many egregious lies told since the start of the conflict by the majority of mainstream western media outlets, including the BBC, Channel 4, and The Guardian. Bartlett, who previously lived in Palestine and reported on Israeli war crimes and attacks in Gaza in periods throughout 2008-10 and again from 2011-13, also recently visited the Democratic People’s Republic of Korea in the wake of further bellicose threats from the US. She spoke in London as part of a tour across Ireland and Britain, which was very well received by the 70-strong audience. 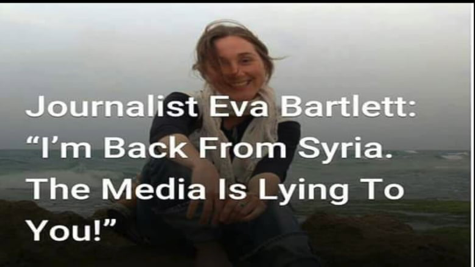 Recently Bartlett, along with several other independent journalists who refuse to regurgitate the official line on Syria, has been under attack by The Guardian and Channel 4 for her work, which involves actually reporting from Syria and interviewing Syrian citizens, something the mainstream western media have been very reluctant to do until recently (understandable, considering the difficulty of finding people to support their narrative, and the embarrassment suffered by C4’s Krishnan Guru-Murthy when he was called out for their propaganda in an interview with Aleppo MP Fares Shehabi – see ‘Blunt hatchets: Guardian attempts to discredit real journalism on Syria’, Proletarian, February 2018. By this point it should be clear to anyone who has properly investigated the war in Syria that the narrative pushed, from the very start, has been a despicable, war-mongering lie in the vein of the Nayirah testimony (the 1990 fake testimony by the 15-year old daughter of the Kuwaiti ambassador to the US that she had witnessed Iraqi soldiers during the Iraqi invasion of Kuwait throw babies out of incubators, leaving them to die, while they looted the incubators) and the dossier of Iraq’s ‘weapons of mass destruction’. These journalists still, even as US Defence Secretary James Mattis, along with the French Defence Minister, admit there is absolutely no evidence that the Syrian army has used chemical weapons, threaten both the misplaced trust that the public has in the media, as well as any ongoing plans to continue the destabilisation or of any potential invasion of Syria. (Robert Burns, ‘US has no evidence of Syrian use of sarin gas, Mattis says’, Washington Post, 2 Feb 2018). However, this admission came mere days before a US-coalition air attack killed around 100 Syrian Arab Army soldiers, a move the US claimed was ‘in self-defence’. This is remarkable double-speak given that US troops or planes should not be in Syria at all, and becomes all the more brazen in light of comments that the US is considering creating a “30,000-strong border force to secure control of the territory held by their partners in Syria”, meaning that the imperialists still have not given up their goal of balkanising and destroying Syria. (see ‘US-led coalition conducts ‘defensive’ airstrikes against Syrian forces”, RT, 07 Feb 2018). While we can, and should, celebrate the remarkable fortitude of the Syrian people and the success of the Syrian Arab Army in driving out the terrorists from the majority of Syria, we must remain vigilant in countering war propaganda here in Britain as the war enters the second phase – the defeat of the US invaders and their supporters in Syria.